Every Entrepreneur needs Fresh, Relevant Content that represents their business. Join us an learn how to develop strong content & a winning strategy for success! 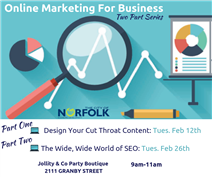 And Be Sure to join us for Part Two: The Wide, Wide World of SEO!